Midwest conflagration of 1871, Metric Week, Florida Man perseveres, dog personalities, more Trump (sigh). 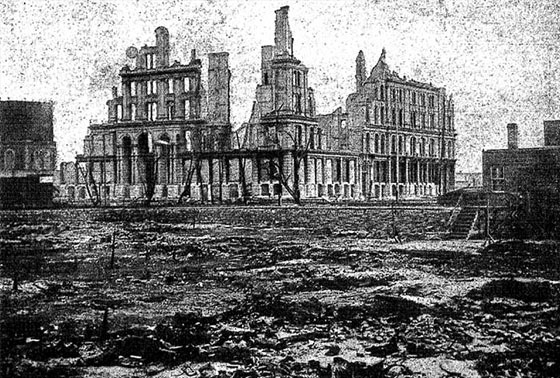 On this day in 1871, the Great Chicago Fire that killed up to 300 people, destroyed roughly 3.3 square miles of Chicago, Illinois, and left more than 100,000 residents homeless, finally burned itself out after two days. While it did begin in Mrs. O'Leary's barn on the evening of October 8, a cow wasn't involed. Yet it wasn't the only fire that night, nor the biggest. A forest fire in Peshtigo, Wisconsin was the deadliest wildfire in recorded history, killing between 1,500 and 2,500 people. On the same day as the Peshtigo and Chicago fires began, the cities of Holland and Manistee, Michigan, across Lake Michigan, also burned and the same fate befell Port Huron at the southern end of Lake Huron as well. A theory suggesting the fires were caused by the impact of fragments of the Comet Biela surfaces from time to time, but has been generally discounted since meteorites are cold to the touch by the time they reach the surface of the Earth. Among other things, this is Natinal Metric Week, which occurs during the week containing October 10=the tenth month of the tenth day. We'd just like to point out we're behind the metric system every inch of the the way, but notes that if God had wanted us to use the metric system, there would have been ten disciples. Despite the hurricane, Florida Man perseveres. See him headbang in Hurrican Matthew to Slayer's 'Raining Blood'. Some people born on October 10 who said some interesting things: Nora Roberts, Harold Pinter, James Clavell, Thelonious Monk, Frank A. Clark, Vernon Duke, Helen Hayes, and Lin Yutang. A mom fed her 11-month-old only fruit and nuts. Now she faces child endangerment charges. Among other things, Donald Trump is the only presidential candidate to be disavowed by two candy companies. Go figure. Obama hits record-high approval rating despite turning country into jobless crime-ridden hellhole. The mind of Donald Trump: "an existence unmolested by the rumbling of a soul?" I was under the weather yesterday, decided to take a short nap after dinner, and ended up sleeping until 4:30 am this morning. Sleep has been a defense mechanism for me over the years. Kevin Baker's review of the second Presidential debate in the New York Times makes me glad I was unconscious: "Donald Trump is a walking example of why it is a really bad idea to let people bring their guns into a bar. He showed himself, once again, to be a rambling, swaggering bully. Listening to him for an hour and a half is like being hit on the head constantly by a rubber hammer — or listening to a classic tavern drunk, full of bluster and bluff, plentiful exclamations and very few facts. To saddle this barstool blatherer up with the full force of the greatest military in the history of the world is to beg for one of Mr. Trump’s favorite words: 'disaster.'" After seeing everything else on the front page of the Times this morning, I think I need to go back to bed.